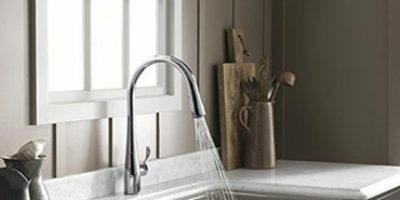 Kohler is a known faucet manufacturer and the K-72218-VS is one of their masterpieces. 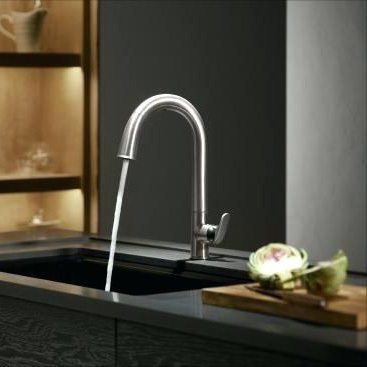 It’s a high arc faucet with features that keep the kitchen clean yet make it absolutely cool. Made with a beautiful vibrant stainless finish, it is a great accessory in the kitchen, but the most important part of it is that it has a motion sensor with 20 milliseconds response time that will allow you to use it without even touching it. Simply wave under the arc and the water stars flowing. Do the same again and it stops. You can use the dishes that you’re about to wash, your hand or anything you have in your hands, the sensor works on anything. Another great feature is the hose that is not visible until pulled out of the spout. The whole faucet is made to look like there’s nothing detachable but the end of the spout is actually a 26-inch hose that can be used for cleaning the sink. The faucet uses the Kohler’s trademark for their models – the DockNetik system that allows the spray head to be docked to the spout by the power of magnetic force. This is pretty revolutionary and everyone that had trouble with over usage of this faucet’s part knows how annoying can become a nearly broken spray head that is not properly docked. It typically uses 6 AA batteries, but if it’s plugged in on an AC socket, then you don’t need to use the batteries, it will operate solely on this power. The electric power is needed for the sensor and for the LED light that’s on the bottom of the spout. This light signals when water is being used and when it’s not. This faucet is made to be dock mounted, so part of it will go under the cabinet and about 9.5 inches over it. The hose length is about 26 inches which means it’s suitable for all kinds of needs. The Kohler K-72218-VS has an elegant and modern design. It is made to fit perfectly in a kitchen that is being used daily. With а design that allows the user to use it hands-free, this faucet is perfect for an excellent cleanup. It is made of metal with a beautiful vibrant stainless finishing that gives the extraordinary look it has. Just under the arc is the sensor that reacts to your hand movement. The sensor is specially designed to react only to your movement and it can’t be activated by accident, so you don’t have to worry about unnecessary waste of water. On the bottom, or better said, on the beginning of the faucet there’s a metal handle that looks excellent just like the rest of it. 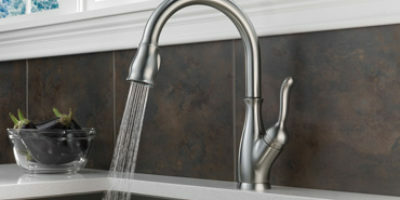 The handle is used to adjust the water’s temperature and you can use it both while the sensor is on and off. You can adjust it while water is flowing or while it is off. The DockNetik system that makes the Kohler company proud is probably the best part of the design. Using the force of the magnet, the hose will get back to its place after use without the need of too much precision. The spout looks like it is made of one piece before the hose is used and looks exactly the same after you return it to place. 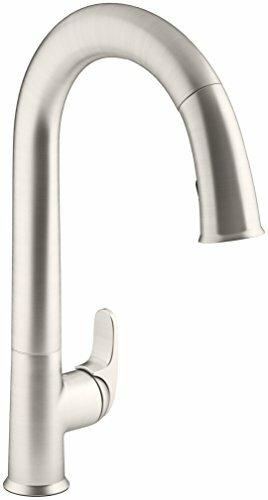 Check out our top-rated kitchen faucet picks here!